ALBA's Board of Directors has adopted this Quality Management System to ensure that the organization and its grower tenants are in compliance with food safety and organic laws and regulations and hold appropriate certifications. In order to implement this QMS, ALBA has created a management structure comprised of trained and certified ALBA staff and qualified consultants. These individuals ensure that ALBA's Growers register as members of the Grower Group (QMF -04) and meet GAP requirements. They also ensure that this QMS meets the ISO 9001:2015, including its most recent updates. The Executive Director is required to meet at least once a year with the Group Administrator and to assess the effectiveness of this QMS in maintaining customer confidence in the safety of food grown on ALBA land and in the integrity of its organic production. The Executive Director will review and recommend to the Board any policy changes necessary to update and improve the QMS. The Group Administrator is responsible for managing the Grower Group and coordinating with the In-Field Technical Staff (see below). S/he is also responsible for reporting to the Executive Director the results of the GAP and organic audits. ALBA and individual farmer compliance with organic certifications are managed through and can be referenced on www.myccof.org. The Internal Auditor performs internal audits on compliance of individual Grower Group members to the Harmonized GAP Standard and on this QMS. The Administrative Assistant provides technical assistance to ALBA farmers in all matters related to food safety and organic record-keeping. The Farm Manager manages ranch operations and provides technical assistance to ALBA farmers in all matters related to production, harvest, and delivery to the ALBA Organics cooler. QMP-05 Training and Competencies outlines the required training and competencies of the above roles. To ensure that the provisions of the management system illustrated in QMP-07 are reviewed and assessed for effectiveness, the Executive Director shall meet, at least once each year, with the Group Administrator and, as necessary, with the In-Field Technical staff. During the management review meeting(s), the Group Administrator will review the findings of the internal and external audits. S/he will discuss the performance of each farmer and the performance of the Grower Group as regards food safety and Organic certifications. S/he will also assess the performance of suppliers and effectiveness efficiency of the QMS itself and describe any unresolved issues that have surfaced since the last management review. S/he will recommend changes to the QMS and present these to the Executive Director. The Executive Director will listen to the assessments provided by the Group Administrator. S/he will take action as necessary directly or through appropriate staff to help individual farmers or the Grower Group to improve performance. S/he will present any QMS policy revisions to ALBA's Board of Directors for adoption. Staff will record Minutes of the management review meeting and disseminated this document to all ALBA personnel who are engaged in ALBA's food safety and organic certification protocols. If the changes to the QMS will affect the farmers' responsibilities or those of the Grower Group, then these individuals and the Group shall receive appropriate and timely notice of these changes. Adaptive management of current management and operational performance will be implemented and the QMS updated to reflect any adaptive management measures taken. 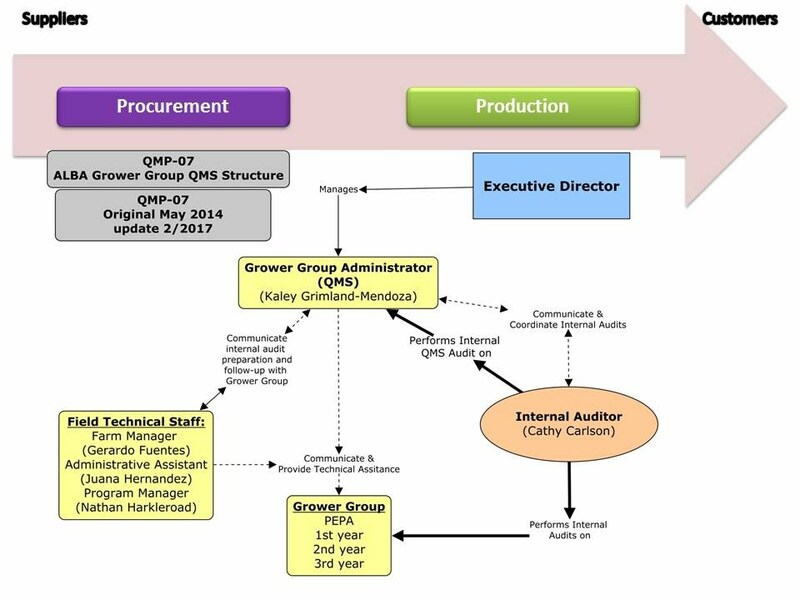 The Group GAP Process and Product Management Organizational Chart (QMP-07) will be updated yearly to reflect any personnel name changes or structural changes.